Ryan “The Lion” Schultz earned his nickname from his intense, in your face fighting style that made him a crowd favorite and earned him the International Fight League Championship among numerous other titles. Ryan has competed around the world and shares his vast knowledge and experience with students of all levels. He was a member of the famed Team Quest fight team prior to opening Trials MMA, wrestled for the University of Nebraska, and was recently awarded his Black Belt in BJJ by Professor Fabiano Scherner. Spend a few minutes around The Lion and you’ll quickly see why he is one of the premier MMA coaches in the world! Steve Peters is a Fort Collins native and brown belt in BJJ. He is a very experienced grappler in both gi and no gi, and brings a very cerebral approach to both the game and his instruction. Steve is an active MMA fighter with his most recent win occurring in the World Series of Fighting. Don’t let Steve’s quiet demeanor fool you, he is a beast on the mats and loves nothing more than to help students overcome hurdles not only in their fight game and but also in their lives. Fabiano is a 3rd degree black belt and the Head Brazilian Jiu Jitsu instructor at Trials MMA. Coach Scherner is a 6x Brazilian National BJJ Champion, 3x World No-Gi Champion, 1x World BJJ Champion, 1X Pan American Champion, 1x American National BJJ Champion, 1x American No-Gi Champion and a 2x UFC veteran. Fabiano received his black belt from Murilo Bustamente — one of the Brazilian Top Team founders. 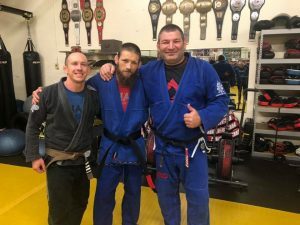 Jerrod recently retired after 21 years as a police officer, is a Veteran of the United States Air Force, BJJ Purple Belt, Amateur MMA fighter with a record of 3-1, and a volunteer youth wrestling coach. He spent the majority of his police career coaching new recruits and veteran officers on how to develop a warrior mindset, while teaching self defense skills in numerous real life settings. Jerrod brings his extensive experience, and an attitude of contagious enthusiasm with him every time he steps on the mats. Winston brings with him a wide array of knowledge in martials arts. Winston started his training in Sanshou Kung Fu before progressing into Dutch style kickboxing, Muay Thai and eventually the grappling arts of Submission Wrestling and BJJ. Winston has competed in MMA, Muay Thai, Kickboxing, Boxing and Grappling events. Winston spends a lot of time working with youth in our community and helping them to find their path in life. Most days you can find Winston and his family at the gym either coaching or attending classes. Graham is a Brown Belt in Brazilian Jiu-Jitsu which he began studying while living in Los Angeles in 1998. In 2010, he earned his purple belt under Pedro Schmall and won the 2012 Absolute at the Colorado State Championship. For several years, Graham owned and operated Rocky Mountain MMA until the birth of his twin sons in 2012 pulled him away from the demands of small business ownership. Graham’s extensive knowledge,smooth technique, and laid back demeanor, guarantee he’ll help you elevate your game!